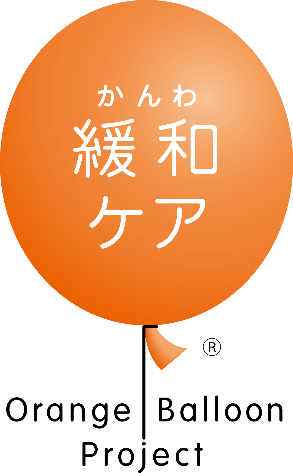 Orange Balloon Project® was developed to promote public awareness of palliative care in Japan. We adopted the orange balloon as logo marks of this project (fig. 1). In April 2007, our department drafted the project for dissemination and enlightenment of palliative care with the aim of correcting the misconception that “palliative care is for people who give up life and just wait for death” and providing true meant of it to the public. Subsequently, Japanese Society for Palliative Medicine has started activities to promote public awareness under entrustment from Ministry of Health, Labour and Welfare. Palliative care refers to health care that not only relieves total pain associated with various illnesses but supports people to live fully in their own ways. It is not something that comes to you as the last resort before the death. It is something you can receive any time after diagnosis, in some cases even before diagnosis. It can be provided by physicians as well as all the other medical professionals around you. If your symptoms haven’t been sufficiently relieved in the current situation, you can receive better supports in collaboration with palliative care professionals, palliative care teams, or a palliative care units/ hospices. provides relief from various painful symptoms (nausea, dyspnea, pain, fatigue, etc.) during treatment. staffs support patients and their families to reduce their emotional suffering such as anxiety and concern. staffs closely work with patients to deal with social discrimination (employment/dismissal issues) due to the diagnosis of cancer and other disease as well as financial issues. Palliative care is available anytime and anywhere. You can receive the care not only in a hospital but in your home or a nearby clinic. You will be covered by the Japanese healthcare system secure to provide palliative care as long as you are eligible for it. In addition, palliative care is not only for patients but for their families. Care for family members is considered very important because they often experience emotional suffering just like patients. As the number of young patients has been growing in recent years, care for children of patients is also considered as an important part of palliative care. Our website “Kanwacare.net” was created for the public to recognize the necessity and importance of palliative care widely. We have two categories of information one is for the public, patients and their families. The other is for medical professionals that provides the informations, movies and pamphlets help to improve the patients Quality of Lives. We hope you find this website helpful. With this information, hopefully more patients and their families will be received palliative care throughout their lives and palliative care will become easily accessible for everybody in our society.